A tiny newborn dumped and left to die is in good hands thanks to good hearts and good luck. Donna Crawford was feeding the colony of cats she cares for, at around 11 o’clock this morning, when she heard a kitten crying. The cries were coming from this tiny baby, who was tied into a garbage bad and tossed into a dumpster. This was in Pennsville, NJ, where temperatures went into the 90s today. Unable to reach way down into the recently emptied bin, Donna improvised with a metal pole she found on the site and fished the bag out to save the kitten. 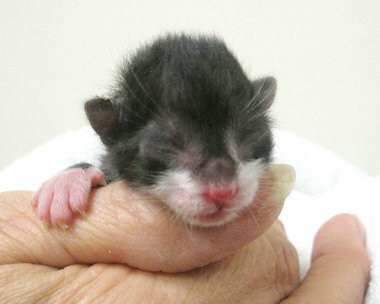 The kitten is about 5 days old and still had his umbilical cord attached. He was tied into the bag along with some fast food trash. Donna saved the baby and he is now in the care of Maddie & Friends, a spay/neuter and rehoming organization headquartered in Salem, NJ. It is by chance or by providence that Donna came along to feed the cats today, and that she came in time to save the baby before the situation turned tragic. Despite the terrible circumstances that brought him into the care of Maddie & Friends, the kitten is now poised for a good start in life. Raw video shows the baby eagerly taking a feeding from capable and loving hands. Blankie, Are You My Mother? Oh come on little kitty grow up to be big and strong and healthy with a great and loving home. You can do it!